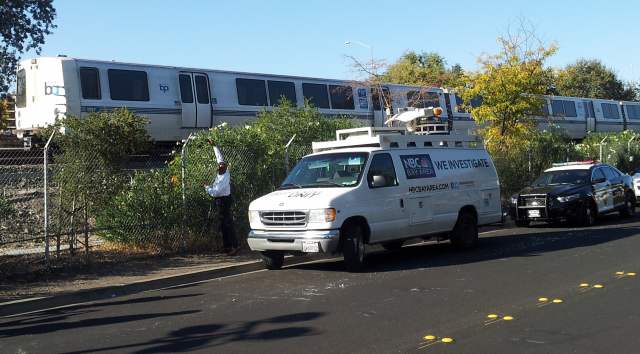 The BART train involved in an October that killed two workers inspecting the tracks. (Alex Emslie/KQED). The National Transportation Safety Board is urging federal transit officials to take steps to prevent trackside accidents like the one that killed two BART workers during the transit system's strike in October. In a letter to Federal Transit Administration chief Peter Rogoff today (embedded at the end of this post), NTSB chair Deborah Hersman said her agency still has not determined the probable cause of the Oct. 19 incident that killed Christopher Sheppard, 58, of Hayward and Laurence Daniels, 66, of suburban Sacramento. But Hersman says because of the circumstances surrounding the BART incident, the NTSB wants transit officials to immediately require enhanced safety measures for commuter-rail agencies around the country. Those steps could include new warning devices or "positive train control" systems that allow better monitoring of trains and trackside workers and allow central controllers or workers to stop trains in an emergency. The NTSB also wants a nationwide ban on the practice of granting workers permission to work at trackside while making them solely responsible for protecting themselves from moving trains and equipment. That last recommendation is a direct response to the BART incident. Sheppard and Daniels were killed after venturing had ventured into BART's right-of-way between the Walnut Creek and Pleasant Hill station to look for a reported defect in the tracks there. BART's central controllers granted the two "simple approval" to go on to the tracks, a clearance that meant they were responsible for their own safety. Trains were operating in the area, and controllers issued a brief alert to crews that workers were on the tracks. Daniels and Sheppard were struck and killed by a train operated by a BART management employee who was being trained as an operator as BART went through its second strike of the year. BART has since eliminated the simple approval procedure, which was also in use when another BART employee was killed by a train in 2008. Sal Cruz, a veteran train controller at BART, said "it's going to be a long process" for the transit system to implement the NTSB's recommendations. At the same time, he said both managers and workers at the agency have "known for quite some time that these recommendations were coming down the pipeline" and are already studying new safety systems. Cruz said a committee made up of both management and union representatives are evaluating safety systems. "We’re hoping in the next few months for BART to adopt one of these technologies," he said. Alex Emslie of KQED News contributed to this post.